KASHGAR, XINJIANG, CHINA — “U-yu-ghur, we say U-yu-ghur,” Hajji Abdulaziz* gently explains to me, as I take a seat at the front of his fabric shop, blankets and seat cushions in a dizzying array of colors, stacked from floor to ceiling. A smile cracks across his face, floating in the middle of short white facial hair, and he reaches for a piece of cardboard and a pen. “See, this is how it is written.” Abdulaziz slowly writes out the word Uyghur, in its Arabic script, and I hide my embarrassment. Then he turns to scold his granddaughter, a toddler in a pretty yellow dress who has jumped into a muddy puddle on the side of the road. I can’t tell exactly what he is saying, because he switches from Urdu to Uyghur, a language with roots in the Mongolian steppe, and the mother tongue for dozens of Turkic languages spoken all the way west to Turkey. We are near the northern limits of Pakistan, in the ancient city of Gilgit. One hundred thirty-five miles to our west lies the Wakhan Corridor, a narrow strip of Afghanistan created a century ago as a buffer between British-controlled India and the Russian-controlled territory that is today’s Tajikistan. To the east lies Kashmir, and beyond it Tibet. But Abdulaziz’s attention is to the north, across the Karakoram Mountains, in China’s westernmost province of Xinjiang. Born in Xinjiang, he has spent most of his life in exile. The Uyghurs are, in some ways, the cultural ancestors of modern Turkey, and they have always shared more linguistically and culturally with their neighbors to the west in Central Asia than with the Chinese to the east. Those advocating for an independent country even refer to Xinjiang as East Turkestan. Since annexing them into the People’s Republic of China in 1949, Beijing has tried to turn the gaze of the Uyghurs east, believing the inspiration to fight for independence comes from outside its borders. It’s been an uphill battle. Uyghurs have mingled with Pakistanis for half a century, relying on their Muslim neighbors to the south for trade and religious education. And after the breakup of the Soviet Union in 1991, China’s Uyghurs watched their western neighbors emerge from an officially atheist communist regime much like their own, and begin to reconnect with their Islamic heritage. The Taliban-backed Islamic Movement of Uzbekistan emerged in the region, and neighboring Tajikistan even witnessed a brutal civil war between Islamists and Soviet-aligned liberals. China feared Xinjiang could be next. After the 9/11 attacks, Beijing successfully campaigned to have its own struggle to put down Uyghur separatism included in the new global War on Terror. A series of treaties ensured no country in the region would harbor any Uyghurs that China felt were part of any movement for independence. Today, an ongoing crackdown by Beijing has resulted in more than 800 arrests throughout Xinjiang, which holds a quarter of the energy-hungry country’s oil and natural gas reserves. Scores of Uyghurs have been sentenced to death. China has placed severe restrictions on journalists in the province, and often the only details about incidents of violence comes from official Chinese sources. Yet, even according to official accounts, tensions between Uyghurs and the government have only gotten worse and increasingly spill over into violent confrontations involving crowds of thousands. Hundreds of Chinese civilians have died in the past few years – killed in riots, blown up in suicide bombings, or hacked to death by knife-wielding Uyghurs – as far east as Tienanmen Square in Beijing. This July, Chinese officials say 215 Uyghurs armed with knives and axes attacked a police station outside the Xianjiang city of Kashgar. Uyghur rights activists say the attack occurred in response to the killing of a family of five after they refused to comply with restrictions on wearing the hijab. Riots then broke out, and Chinese officials say police killed 59 “terrorists,” but Uyghur activists based outside China say they have evidence that more than 2,000 people were killed. Similar confrontations took place in 2009 and 1997, resulting in hundreds of deaths, and thousands of arrests. Many Western security experts say China’s own policies are to blame for the unrest. They say China has attempted to rewrite the region’s history to make it seem like ethnic tensions in Xinjiang have roots in modern global Islamism, instead of being a continuation of a centuries-long conflagration between Uyghurs and Han. To discourage the practice of Islam among the Uyghurs, China has barred children and government officials from fulfilling a number of basic tenets of their faith. And economic and social policies in Xinjiang have been introduced in an attempt to force Uyghurs to integrate into an imagined ethnically-harmonious Chinese society. Xinjiang, literally “New Dominion” in Mandarin, borders eight countries: Kazakhstan, Kyrgyzstan and Tajikistan to the west, Russia and Mongolia to the north, and Afghanistan, Pakistan, and India to the south. It’s China’s largest province, and home to some of its largest mineral resources. Most of the province is dominated by the vast Taklamakan Desert, a sea of shifting sand dunes home to the Lop Nur Facility, built on a dried up salt lake that has hosted nearly every Chinese nuclear test. It’s also one of the country’s poorest provinces, and the only one with a majority Muslim population, but soon that will no longer be true: Uyghurs made up nearly 84 percent of Xinjiang in 1945, today they account for less than half. The shopkeeper Abdulaziz is from Kashgar, an ancient crossroads oasis at the western edge of the province. It’s closer to Baghdad than to Beijing, and about five times closer to Islamabad, Kabul, and Tashkent than to China’s capitol. After taking control of the region in 1949, the Communist government in Beijing began trying to dismantle the traditional Islamic power structure in Xinjiang, removing judges that ruled according to sharia law, seizing property belonging to Islamic trusts, and shutting down thousands of shrines devoted to Sufi saints. Around 300,000 Uyghurs fled to Soviet states to the west, and thousands of others, including Abdulaziz and his family, trekked across the Karakoram Mountains to settle in Pakistan. In 1963, the border with the Soviet Union was sealed, after relations with China soured. Between 1964 and 1979, Beijing even prohibited Uyghurs from traveling for the hajj, the once in a lifetime obligatory Muslim pilgrimage to Mecca. But with the death of Mao in 1976, China began relaxing some policies in Xinjiang. In 1982, it allowed civilians to travel along the newly-built Karakoram Highway connecting to Gilgit, and while Uyghurs were still closely vetted, many were able to finally relink with their families in Xinjiang. That more relaxed stance lasted less than two decades. On September 12, 2001, China sealed its border with Pakistan. It welcomed the new US-led coalition push to fight Islamic fighters in Afghanistan, and emphasized that its own problems with the Uyghurs were part of the new global War on Terror. In Pakistan, where many parents had sent their children to study Islam after Beijing shut down religious schools in Xinjiang, Uyghur students found themselves in the crosshairs of a government eager to show its commitment to fighting terrorism. Twenty-two Uyghurs in Pakistan ended up spending more than a decade at the Guantanamo Bay detention facility. Other countries have followed Pakistan’s example in aiding China’s apprehension and imprisonment of Uyghurs it suspects of terrorist activity. Just this year, Thailand ignored pleas by human rights groups and the United Nations High Commissioner for Refugees and agreed to return more than 200 Uyghurs detainees to China, which claims they were jihadists making their way to Syria. The China-Pakistan alliance, described by officials as “deeper than the Indian Ocean, and higher than the Himalayas,” is a purely pragmatic one, inked by the leaders of two nations whose domestic policies on religion could not be more opposite. Because China and Pakistan share long-running hostilities with India, the two militaries enjoy a close partnership. And Chinese goods need access to the Pakistani warm water port of Gwadar on the Indian Ocean, so both countries cooperated to build the Karakoram Highway, which also continues to be a principle conduit for Uyghurs to interact with the rest of the Muslim world. 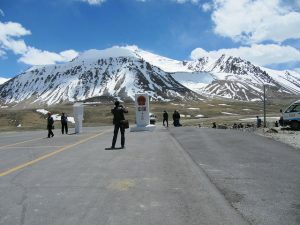 The highway runs through the 15,000-foot-high Khunjerab Pass, on either side of which are numerous valleys cutting east to Indian-controlled Kashmir, and west to Afghanistan and Tajikistan. It’s a security nightmare for China: everything from endangered turtles and heroin to explosives and jihadists are smuggled through here. At the Chinese border post, Red Army soldiers toting machine guns and wearing body armor meticulously pour over every shred carried by travelers. Any documents with Arabic on them are tossed aside, and laptops, phones, and cameras perused for material that might inflame the Uyghurs in Xinjiang. Chinese authorities usually claim the source of Xinjiang’s discontent is outside its borders, that Uyghurs have been radicalized, trained, and armed by religious extremists in Pakistan. It’s not the Uyghurs here they say, but extremists in Pakistan that are responsible. According to official Chinese accounts, several militants involved in attacks in Urumqi this year were caught near the border, apparently trying to leave the country. Officials made similar remarks following unrest in 2011 and 2012. Looking to neutralize any radical tendencies among Uyghurs in Pakistan, China has attempted to gain their good will through scholarships and lucrative business deals, but it’s unclear if that is working. A few blocks from Abdulaziz’s shop in Gilgit, Yusuf stops in to check on his father’s business, a boutique store selling imported watches. “I had some uncles who were landowners, some were killed by the Chinese,” the clean-shaven, thirty-something Yusuf explains when I ask him why his family left China. His family’s relationship with Beijing has improved. Today, he travels to Xinjiang every few months, trading in watches, dried fruit, or cheap Pakistani cosmetics. Yusuf’s father is the head of the Overseas Chinese Association (OCA), a group set up by the Chinese embassy in Islamabad in 2003 to connect Uyghurs in Pakistan to Beijing. The group has doled out more than $150,000 in scholarships and slush funds to cooperative Uyghurs in Pakistan, including Yusuf’s father. At a nearby hotel, Salem Jan, another OCA official, shows me a video on his phone: a dozen Uyghurs sit at round tables, fidgeting in their seats, half-empty bottles of vodka and champagne before them. A handful of their colleagues have joined a Chinese businessman and two women at the other end of the room, and are awkwardly trying to dance with them. “They always try to get me to drink, but I do not,” Jan says. “It’s OK to do this right? I mean, I go to China, but secretly I am hoping the Uyghurs defeat them.” “We will eventually defeat them,” he says, after a moment of thought. Beijing worries Uyghurs like Yusuf and Jan might link up with militant groups like the East Turkistan Islamic Movement, an organization operating alongside Al-Qaeda and the Taliban, in areas along the border with Afghanistan. But most Western security experts think the group’s numbers are far too small to pull off the kind of attacks seen inside China. The solution to China’s Xinjiang problem, the say, lies within its own borders. I only wanted to buy one doppa, but soon after stepping into Mehmet’s shop in the old city of Kashgar, I find myself juggling half a dozen of the four-corner velvet caps, worn by Uyghurs and most Turkic men in the region. “Pakistani?” Mehmet asks. “Yes,” I reply in my elementary Uyghur, having learned by now that identifying myself as a Pakistani will get me further than as an American. Sure enough, Mehmet switches over to Urdu. Until the fall of the Soviet Union, Xinjiang’s Uyghurs primarily interacted with Pakistanis, mostly traders who would travel up to Kashgar. After the Karakoram Highway opened, this exchange picked up, and today, many of the middle-aged Uyghurs I meet in Kashgar, especially merchants like Mehmet, speak with me in Urdu. “Ramadan starts tomorrow?” I ask. Every year for most of the last decade, Beijing has made Ramadan a particularly trying time to be a practicing Muslim in Xinjiang. School children and government employees are officially barred from fasting, presented with lavish lunches in the afternoon for the month that are to be consumed in the presence of teachers and bureaucrats loyal to Beijing. Mehmet’s shop is one of several doppa outlets I come across in the ancient bazaar of Kashgar, re-built by Beijing as something that would belong in a Disney production of Aladdin. What was once the largest bazaar in Central Asia, famed for stocking nearly everything under the sun, has become a marketplace catering primarily to tourists. Everything seems to be a uniform shade of pink. The winding alleyways of the old city are paved in pink bricks, the formerly brown, mud plastered, sides of homes are now covered in a layer of pink paint. 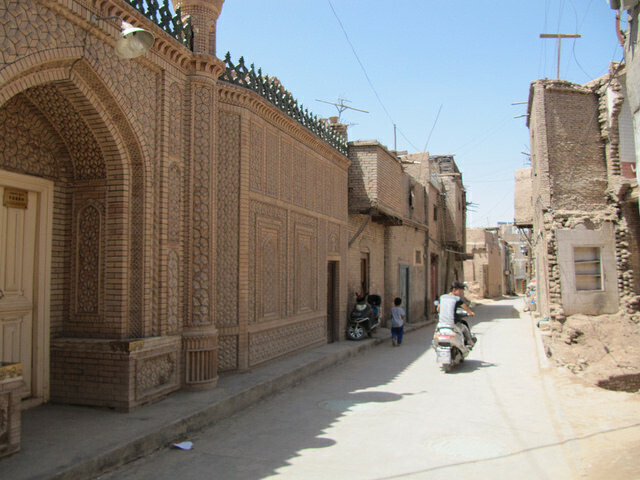 The facades of the dozens of mosques interspersed in the city have been standardized: pink bricks make up the walls, and an open archway decorated with light stone carvings leads into a small portal and a wooden door with a sign above it, in Uyghur, pointing out that it is illegal for anyone under 18 years to enter. It’s so slick, it’s hard to believe the old city is more than 2,000 years old. As I attempt to settle on just three doppas, Mehmet excuses himself from my attention: a trio of Han Chinese tourists have shown up, cameras in hand, led by a Han guide in a dress whose hemline falls well above her knees. She stands out in Kashgar, where nearly all women cover their heads, whether with a tight-fitting bandanna tied at the back of the head, or a colorful scarf wrapped around hair tied in a bun. There are even a handful of women covered from head to toe in a kind of thick, dark burka, with a flap to cover the face that is easily tossed back. Having assured himself the tourists are not going to buy more than one doppa, Mehmet turns back to me. The tourists move on to a traditional medicinal shop across the street, drawn by sight of dried lizard carcasses hanging above a seated, bearded Uyghur man. Mehmet opens a wooden cabinet in a corner to pull out what is apparently a chapter copied out of a book. “This was one of my elders,” he says, pointing to a portrait of man with a close-cropped beard, sporting a turban, his head tilted a bit to the right. It’s a biography of Qutluq Haji Shawqi (1876-1937), one of the preeminent scholars of the jadidi movement in Kashgar, a pan-Turkic Islamist campaign that resulted in the first modern independent Uyghur nation in 1933, The Turkish Islamic Republic of East Turkestan. The Turkish Islamic Republic of East Turkestan was the result of a three-year rebellion, which began in 1931, after a Han official forcibly married a Uyghur girl. Jadidi scholars like Shawqi roused support for Uyghur rebels, who took hold of the old city of Kashgar, the historic seat of power in Xinjiang, and declared independence. Its leaders drafted a constitution for a secular, Islam-inspired republic, minted their own coins, collected taxes, and tried negotiating international treaties. Turkish expats were promised citizenship. But the nation was never recognized by any regional powers, and only lasted from November 1933 to April 1934. In 1934, a Han warlord, backed by thousands of Soviet troops, tanks, and armor, routed the rebels and retook Kashgar. In 1944, the Soviets decided to back a Uyghur rebellion against Chinese Republican forces, carving out space for the second short-lived Uyghur nation, the East Turkestan Republic. When the People’s Liberation Army reached Xinjiang in 1949, Uyghur leaders were persuaded to join the new Communist nation, lured by a promise of autonomy that was never fulfilled. 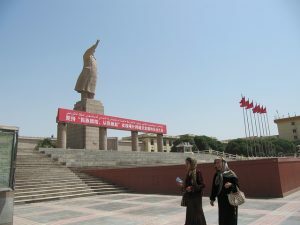 Set far back from Renmin Road, the main thoroughfare in new Kashgar, a 79-foot high statue of Mao Zedong waves to visitors, his back towards the old city. The statue was erected in 1968, at the height of the Cultural Revolution, and some locals claim Uyghurs have tried to destroy it on several occasions since. Across the street, several armored personnel carriers have pulled onto the concrete sidewalk of People’s Square. Scores of troops wearing camouflaged uniforms and body armor, dragging riot shields, assemble in marching formation in the afternoon heat. A few blocks west, a giant billboard looks down at shoppers being frisked by police at the entrance to a shopping mall, a Uyghur man in a traditional tunic, cradling a tambur like a guitar, beckoning them to try a can of Red Bull. “He was a Kafir [non-believer],” my taxi driver states, when I explain to him I came to see the statue of Mao. Until 1937, Mao’s vision for China was one where ethnic groups like the Uyghur and Tibetans could enjoy significant autonomy. By 1951, that vision changed, and the only evidence of that promised autonomy was the province’s official name: the Xinjiang Uyghur Autonomous Region. China spans five time zones, but here in Xinjiang, like in Tibet, locals have their own time zone, two hours behind Beijing. It only serves to add to the confusion over exactly how Xinjiang fits into China. In most Muslim countries life is interrupted five times a day by the momentary din of the adhan, the call to prayer. In Xinjiang though, mosques are prohibited from using loudspeakers, so during Ramadan, when Uyghurs need to keep close track of the timings of the morning and sunset prayers, they must consult a schedule on their own. I am in Kashgar during Ramadan, and the Muslims here – the waitresses in hijab serving Han diners, the hawkers outside peddling trinkets on the street – are in a different world. Kashgar has been almost entirely Muslim for more than six hundred years, but the feeling as a fasting Muslim is more akin to that of the Muslim minority living in a post-9/11 United States. The Uyghur Muslims in Xinjiang have become a subculture in their own land. At my hotel, a young Uyghur pulls out his smartphone when I ask him when we can break our fast. The young man then starts playing me religious songs by the Turkish pop-music singer Mesut Kurtis. The old city itself is an unparalleled example of an ancient Islamic Central Asian neighborhood. But that may soon change. “They are tearing it all down, look, take a picture, tell the world about it!” my taxi driver implores. I’ve told him I am a journalist, and he has become excited enough to shuttle me around for the afternoon. The debris of walls covered in ceramic mosaics with floral designs and a wooden veranda poke out through a pile of bricks and dust. 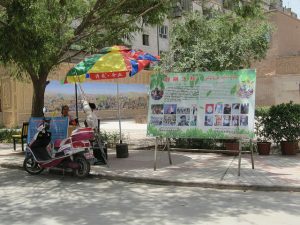 On a nearby sidewalk, across from a shop selling traditional cookies, a giant poster board has been erected, text in Uyghur and Chinese above two columns of pictures. On the right are headshots of Uyghur women wearing headscarves and covering their faces with nikabs, along with men with beards. On the left, attractive young Uyghur women wearing doppas, their hair in two braids going down to their hips. In other pictures, happy Uyghur men and women in doppas dance in the streets. There are poster boards targeting women – “Let your beautiful hair flow!” they implore – and others targeting men, each staffed by a pair of Uyghur government officials. My driver makes small talk to distract two female officials as I snap pictures. The busiest part of the old city is the main street, which runs past two mosques and a string of over-priced coffee shops and restaurants. It leads to the 574 year old Id Kah Mosque, a massive walled courtyard garden shaded by trees, and on the side closest to Mecca, hundreds of wooden columns holding up a wooden roof decorated with floral and geometric designs. At the main entrance to the mosque, the wall towers up to make space for a giant archway and two minarets, a style typical across Central Asia. It’s China’s largest mosque, and can hold up to 20,000 worshippers. Chinese tourists pose for pictures at the mosque’s arched entrance, which sits at one end of an expansive plaza. A Bactrian camel appears mildly annoyed at the line of people waiting to ride it; the more daring tourists climb atop a horse and hold on as a Kyrgyz boy coaxes the animal into rearing. In July, a few days after the violence in Yarkand that killed between 96 and 2,000 Uyghurs (the numbers change depending on who you ask), the Imam of the Id Kah Mosque was stabbed to death. Jume Tahir, 74, was leaving the mosque after morning prayers when three men attacked him. Tahir was a former member of the National People’s Congress and a vocal critic of violence by Uyghurs. Four years earlier, in July 2009, after thousands of Uyughurs and Han clashed in riots in Urumqi that killed at least 197 people, Tahir had appeared on state-controlled television to declare the killing of innocents as un-Islamic, adding the rioters threatened Xinjiang and China’s economic development. After night prayers at a mosque down the street from Id Kah, I strike up a conversation with the younger attendant of the mosque’s ailing Imam after night prayers. “You are from Pakistan?” he asks. “The Imam speaks Urdu, he studied there.” Uyghur men and boys stream past us, as I sit on the ledge at the bottom of a flight of stairs to put my shoes on. Technically, it is illegal for children to be in a mosque at all, but locals are either flouting the law, or police are ignoring them for the time being. The Imam wears a thick white turban, and a long white beard swings to and fro between the open front of his cream-colored, blue striped robe as he makes his way down the stairs. All the Imams I come across in Xinjiang are dressed the same way, an effort by Beijing to standardize their appearance. It’s not the only thing about them being regulated. “Do you miss Pakistan?” I ask the Imam. “I was there a long, long time ago,” he replies in Urdu, with a slight smile. “We do not go there anymore,” his young attendant chimes in. Perhaps he senses where the conversation is heading, because he quickly ushers the Imam to the sidewalk and they walk away. Teaching Islam in informal settings – even something as simple as how to read the Quran at maktaps, something analogous to Sunday school in the US – has at times been either outright prohibited by the law, or discouraged through intimidation and close monitoring of the gatherings. Would-be Imams must be admitted into government institutions, where students must “love the motherland, support the socialist system and the leadership of the Communist Party of China.” According to accounts collected by Uyghur rights groups based outside China, half the time during the three years spent training is devoted to taking classes extolling the virtues of Marxism. Imams are taught how to read the Quran in Arabic, but not enough of the language to interpret the book’s meaning themselves. Religious texts, especially translations into Uyghur, are prohibited unless they are approved by Chinese authorities, and several Uyghurs tell me stories of book sellers that have disappeared after police found them with copies of the Quran in Arabic imported from abroad. Muslims seeking to go on the hajj are carefully vetted. These controls on how Islam is taught and practiced in China are administered by government officials, but enjoy the approval of the Islamic Association of China, a group of scholars that advise Beijing on its policies towards Muslims. Jume Tahir, the Kashgar Imam stabbed to death in July, was the vice-president of that organization. Around half of China’s 23 million Muslims are Hui, an ethnicity distinct from the Uyghurs and in fact very similar to the Han, who make up more than 92% of the country’s population. The Hui speak Chinese and, unlike the Uyghurs, have lived alongside the largely non-Muslim Han for centuries. Rights groups have accused China of putting religious restrictions in place in Xianjiang that they do not implement elsewhere in the country. This has lead many people to conclude that the Uyghurs are being targeted for ethnic reasons, not religious ones. Chinese officials make a point to say they are fighting the “three evils of separatism, extremism and terrorism.” The Hui Muslims might be extremists or terrorists, but it would be difficult to imagine them as separatists since they have coexisted willingly with the Han for so long. The Uyghurs in Xinjian though, have a history of trying to split from Beijing and thus are targeted by these harsh laws. One afternoon, I head a few kilometers outside of Kashgar to check out the Apak Khoja Tomb, marked on the tourist guide I picked up in my hotel lobby as the final resting place of the Fragrant Concubine. The site is a complex of Islamic buildings, dominated by a mausoleum, its walls adorned with bright green, blue, and yellow tiles, the four minarets set at the corners of the building gently tapering in at the top, capped with onion-shaped domes and spires. 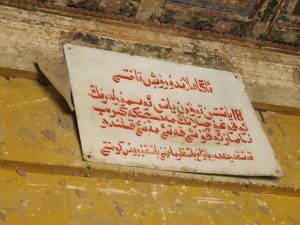 Inside are dozens of tombs belonging to the descendants of Makhdum-i Azam, a 15th century Sufi preacher credited with bringing Islam to the region. The complex includes a seminary run by the descendants of Makhdum-i-Azam, known as the Affaqiyas. In one corner of the shrine is a rickety old horse cart, reported to have carried the body of Xiangfei (Iparhan in Uyghur), a descendant of Makhdum-i-Azam, back to Kashgar to be buried, after spending most of her life in Beijing, in the court of the Qing emperor as a concubine. She is called the “Fragrant Concubine” because her body reportedly naturally exuded a pleasant smell. “At first she was conferred the noble title of heguiren, upgraded to pin (imperial concubine) three years later and to Rong Fei (higher rank of imperial concubine) at the age of 35,” explains a sign at the tomb in Chinese, Uyghur, and English. “In 1788 she died from disease in Beijing at the age of 55. Since then numerous tales about this fragrant concubine have appeared, expressing the good wish for unity and mutual love between different nationalities since ancient times.” Visitors can dress like Xiangfei and have their portrait taken, but it’s a hot Ramadan afternoon, and the photographers furiously fan themselves in the shade. This August, government-backed production companies announced a cartoon based on the life of Xiangfei, in an effort to highlight what they view as an example of Han-Uyghur harmony. Yet the cartoon’s makers are having a difficult time finding Uyghur voice actors and musicians, because the narrative of Xiangfei being portrayed is entirely different from the one known among Uyghurs. The story known among the Uyghurs – and many historians – is that Xiangfei was one of thousands of Uyghur girls taken as war booty by the Qing imperial army, which had just won a decade long war that saw the first Chinese rule in Xinjiang in more than a thousand years. According to Chinese sources, the war resulted in the death of around a million Uyghurs. According to Uyghur historians, Xiangfei refused to ever sleep with the emperor. She was killed by the emperor’s mother who suspected she was planning to kill her son. Even as the province’s demographics have shifted in favor of the Han – they make up about 40 percent of the population today – there is little love between the two ethnic groups, despite government efforts. This August, officials in a central Xinjiang county announced they would pay $1,600 dollars a year for five years to couples that included a Han and another ethnic minority, like a Uyghur. Chinese officials are even planning to build a new city in the Xinjiang desert to be settled by mixed couples. The efforts at assimilation and integration don’t stop at cartoons and marriage incentives, though. The Uyghur language itself is, according to rights activists, a target of Chinese authorities. This August, prosecutors in Urumqi sentenced a Uyghur linguist, Abduweli Ayup, to eighteen months in prison for opening a Uyghur language school that was allegedly lacking official permits. Ayup had spent time as a graduate student in the United States, and supporters say he was only interested in preserving the language he had devoted his life to studying. Uyghurs are thought to be among China’s poorest ethnicities, and rights groups attribute that fact to Xinjiang’s ever-changing policy on what language is taught to children in schools. In 1958, authorities attempted to replace the Uyghur alphabet – traditionally using a modified Arabic script – with a Latin script. Between 2000 and 2013, Beijing changed its Uyghur language policy three more times, finally just settling on instruction in Chinese for all school children. “Right now, even Uyghur students learn the Uyghur language as a foreign language,” the linguist says. It’s not just a question of losing the Uyghur language though – the inconsistent curriculum in Xinjiang has produced several generations of Uyghur high school graduates who are unable to match their fellow Chinese students in university, contributing further to the economic gap between the two ethnic groups. So why come down so hard on Uyghur? Critics of Beijing say its an attempt to cut Uyghurs off from a regional Turkic heritage. Some of the most prominent Uyghur leaders outside China live in Turkey, like Mehmet Riza Bekin, who rose to become one of the highest ranking generals in the Turkish army, and a commander in NATO. After retirement, he founded a number of organizations calling for the independence of East Turkestan. Whether genuine or not, the idea of a country that welcomes the Uyghurs explains why many I met in Pakistan and China said they would like to move to Turkey. Some, like Abdulaziz, the fabric seller in Gilgit, have already sent their children there. *The names — and often other identifying details — of some people mentioned in the story have been changed for their own protection.